The Raptors are the NBA's hottest team, but they've struggled mightily against the league's top powers. 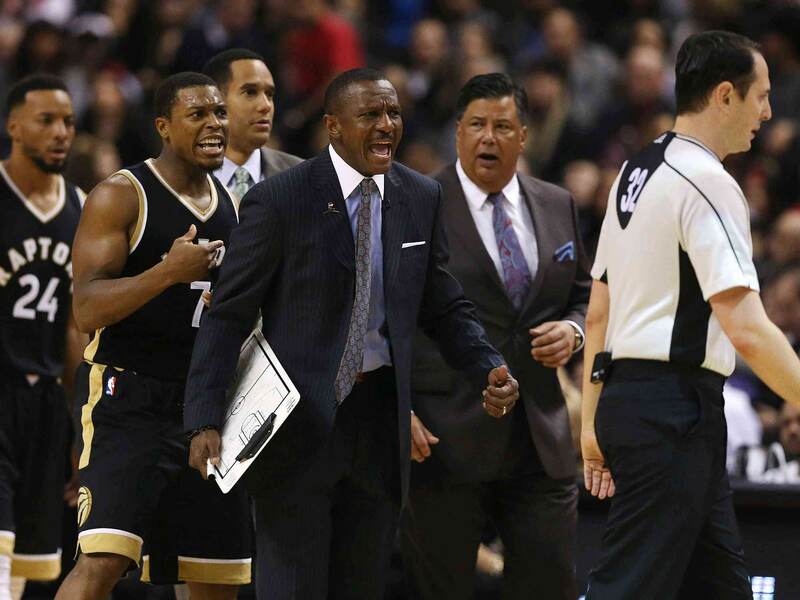 Dwane Casey discusses stopping LeBron, getting over the hump and more. The Raptors enter Monday night's showdown with the Cavaliers in a unique spot: They’re both the NBA’s hottest team and the team most in need of a signature victory. Toronto has, simultaneously, emerged as Cleveland’s top competition in the East without quite proving that it needs to be viewed as a grave threat. Thanks to a league-high six-game winning streak, including five double-digit blowouts, the Raptors boast the East’s top point differential (+8.7) and most efficient offense (their 113.8 offensive rating trails only the Warriors). Kyle Lowry and DeMar DeRozan have picked up where they left off during All-Star campaigns last year, and a frontline rotation that features multiple inexperienced pieces has done enough to keep the Raptors respectable on the defensive end. The annoyance for the Raptors—it’s an annoyance right now, rather than a full-fledged “problem”—is that they are 0-4 against the Cavaliers, Warriors and Clippers, having conceded 120+ points to all three along the way. Toronto has raised the bar for itself by clawing through to the East finals last year and keeping most of its rotation intact this summer, but it’s wide open to charges of “Cleveland’s little brother” until its defense can hold up well enough to claim a victory against one of the NBA’s elite teams. Remarkably, Dwane Casey is now the longest-tenured coach in Raptors franchise history, even though he’s spent roughly half of his five-plus years on the hot seat. After getting over a major hump in last year’s playoffs, guiding Toronto to its first playoff series victory since 2001 and its first ever trip to the conference finals, Casey and company are on track for another potential postseason showdown with Cleveland. The Crossover caught up with Casey last week by telephone to discuss the state of the Raptors’ union, taking the next step, and what it’s like to face LeBron James in the postseason. This interview has been edited for clarity. Ben Golliver: You went to the conference finals last year and you brought back the same core. Do you think teams like the Cavaliers and Warriors look at you differently now? The Warriors seemed to come in with a different edge on Drake Night, like they wanted to make a statement. BG: If you beat Cleveland on Monday night, you’ll have the East’s best record. If not, you’re still No. 2. Do you feel like you’ve separated from the other teams chasing Cleveland? BG: What was your biggest takeaway, or your team’s biggest takeaway, from the 2016 playoff run? Casey: “The road was the thing. We learned how hard it is to win on the road the further you go in the playoffs. If you look at all the playoff series across the league, it was blowouts, feast or famine. We struggled on the road in Cleveland. That hurdle is what we’ve got to learn to deal with now. “But the growth from that experience helped us understand a lot about ourselves. Now, when we go through rough times, players can draw on that playoff run and say, ‘Hey, we’ve been through tougher times and tougher games than this.’ That’s especially true with those conference finals games. When you get to that point, the experience, the atmosphere, the state, the moment. The guys can relate to it. There won’t be a ‘Wow’ moment or an overwhelming moment going on the road in the conference finals if we go through it again because they’ve been there before. BG: You were an assistant on Rick Carlisle’s staff in 2011, when the Mavericks flummoxed LeBron James at key moments during the Finals. What’s the difference between 2011 LeBron James and the one you saw during the East finals? Casey: “You can’t surprise LeBron any more. He’s such a smart player. His intellect has caught up with his athletic ability. He coaches his teammates on the floor and he dictates directions. He calls out our plays. He’s doing far more coaching and directing and letting his basketball intellect come out far more than when we played him back then. BG: Where do you stand on the competitive balance issue. Your front office had to make a financial decision with Bismack Biyombo, who left for Orlando. Meanwhile, the Warriors add Kevin Durant and the Cavaliers keep most of their important pieces. How frustrating is the “Superteam” phenomenon and the “Rich get richer” summer when you’re in that chase mode you were describing? Casey: “We can’t be jealous of Cleveland and Golden State. We all have the same opportunity to improve. It’s on us to get better internally. For our players to get better. Each team has to do that with the way the salary cap situation is now. You have to live with it. “We like our team. We were happy with getting [Jared] Sullinger [in free agency] and he’s going to add to our team dynamic once he’s healthy. [2015 free agent signing] DeMarre Carroll is back and healthy. It’s not about Cleveland or Golden State. It’s on the other teams to get better and for us to get better through free agency. BG: We’re a little more than a month into the season, where are you relative to your preseason expectations? Casey: “Offensively, we’re ahead of expectations. Defensively, we’re behind expectations. We’re not where we want to be covering in certain situations. Our attention to detail defensively needs work. That’s where we’re trying to improve. I wouldn’t use the word ‘disappointed’, but we’re not where we need to be in the first month. That’s something that we’re really harping on. BG: With Biyombo leaving, you’ve had to play the inexperienced Bebe Nogueria and rookie Jakob Poeltl at times in the middle. You’ve also filled the hole at power forward with rookie Pascal Siakam. The defense is ranked 16th (up from the low-20s last week). How much of the defensive issues are due to inexperienced pieces in the frontcourt? Casey: “We can’t just put it on ‘Siakam is a rookie’ and all that. It’s everybody. It’s everywhere. It’s not just one spot. It’s an overall defensive approach and disposition that has to improve. BG: What’s caused the 0-4 showing against the Cavaliers, Warriors and Clippers? Casey: “Defensive end of the floor. That’s it. Breakdowns at certain times. We’d play solid. Against Cleveland, we lost Channing Frye a couple times in transition. Boom. Boom. Boom. He hits two threes and that opens up a close game. BG:​ DeMar DeRozan has gotten a lot of attention for his early scoring numbers. How much improvement has he shown as a decision-maker and passer once he draws the help this season? Casey: “He’s improved, no question. But he’s been doing that the last couple of years. BG: What makes you think your team is ready to take the next step? Casey: “First, Kyle [Lowry] had some bad shooting games in the playoffs last year. I don’t think he’s going to have those same nights. He might have one or two along the way but I don’t think he’ll have the same stretch that he had last year.